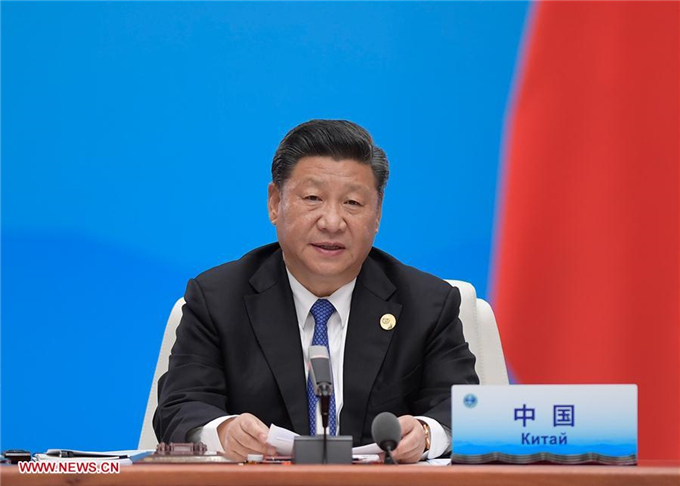 Leaders of the Shanghai Cooperation Organization (SCO) held the annual summit of the Eurasian institution here on Sunday, with Chinese President Xi Jinping chairing the meeting. At the 18th Meeting of the Council of Heads of Member States of the SCO, Xi called for carrying forward the Shanghai Spirit to surmount difficulties, defuse risks and meet challenges. Other SCO leaders also voiced their expectations of future cooperation in various areas so as to give full play to the organization's role after its expansion. Indian Prime Minister Narendra Modi said India will be very happy to cooperate with other SCO countries in the framework of the SCO in different areas such as organic farming, dairy and animal husbandry, agricultural education, food processing and pharmaceuticals. Kazakh President Nursultan Nazarbayev said the Shanghai Spirit is a driving force for the SCO to carry out its work effectively. He suggested expanding trade and investment cooperation from a bilateral level to a multilateral scale, promoting settlements in local currencies among member states, strengthening exchanges in digital information technology and developing infrastructure. Kyrgyz President Sooronbay Jeenbekov said the SCO should play a better role in safeguarding regional security and stability, adding that he hopes its members would further coordinate their positions and actions to better address the threat posed by the "three evil forces" of terrorism, separatism and extremism in the region. Pakistani President Mamnoon Hussain said that in just 17 years, the SCO has become a model organization for safeguarding regional security and promoting exchanges among member states. He suggested SCO leaders strengthen communication and jointly promote a more fair and reasonable international economic system. Russian President Vladmir Putin said combating terrorism is one of the priorities of the SCO, and the organization should take further measures to promote regional stability. He also called for alignment of projects within the framework of the Eurasian Economic Union and the Belt and Road Initiative, thus further enhancing cooperation. President of Tajikistan Emomali Rahmon said regional tensions have aggravated because of various security threats. The SCO should promote closer cooperation in law enforcement and defense, and jointly combat the "three evil forces," drug trafficking and other transnational organized crimes. Uzbek President Shavkat Mirziyoyev called on SCO member states to continue expanding economic and trade cooperation and promote regional integration. The leaders of the four SCO observer states also attended the meeting. Afghan President Mohammad Ashraf Ghani said that the problems of terrorism and narcotics must be confronted comprehensively, and that he looks forward to expanding his country's cooperation with the SCO. Belarusian President Alexander Lukashenko said the SCO is capable of contributing to safeguarding international security. He called for enhancing cooperation in information and cyber security as well as nuclear security. Iranian President Hassan Rouhani said countries in the region need to value their common ground, address disputes peacefully, seek long-term common interests, respect each other and abandon conflict and confrontation for a more secure, stable and prosperous region. Mongolian President Khaltmaa Battulga said the SCO is an important platform for regional cooperation, adding that he hopes Mongolia can increase its participation in regional cooperation within the SCO framework.